Here is a list of 3 free Windows 8 Photo Renamer apps. Whenever we take photos using a webcam or a digicam or any other device, they get saved with some boring names, usually with a timestamp prefixed with IMG. This type of naming doesn’t give much idea about the photos. If you have a Windows 8 PC and you want to give friendly names to the photos you have saved on your hard drive, you should check out some Windows 8 photo renamer apps, available free of cost in Windows Store. For your ease, we have found and reviewed some best free, easy to use Windows 8 photo renamer apps, that you can simply refer to. These apps offer batch file renaming, that means, you can rename several photos together in one go! So have a look and see which one suits your need. Image Renamer is a simple and easy to use Windows 8 photo renamer app that supports both single as well as batch photo renaming. The app works in an easy way and anyone can use it without any difficulty. After installing and launching the app, all you have to do is choose the folder that has the photos you want to rename. After this, the app loads all the photos within the folder and shows them as thumbnails on its interface. You can either choose photos one by one to rename the selected ones, or simply choose the “Rename All” option to rename all the listed photos in one go. The app supports almost all common photo file formats for renaming. As for the renaming pattern, you can specify a common title (like “Harrys Birthday” or something else) after which Image Renamer appends a number automatically. 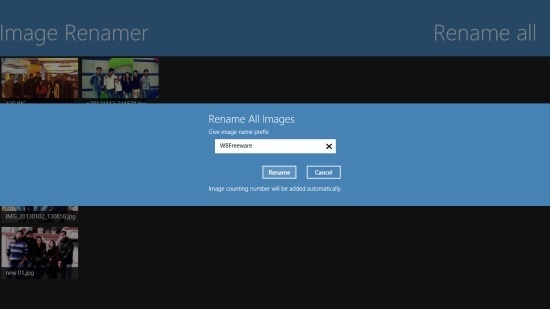 Find Image Renamer under the Photo category in Windows Store, or use the link given below to view it directly in Windows Store. App’s Homepage: Click here to get Image Renamer. PhotoQuickRenamer is another free, yet powerful Windows 8 Photo Renamer app that rename photos using their EXIF data. This app also allows individual, as well as batch file renaming. You just have to choose a target folder and specify the EXIF elements (like a fixed string, photo title, date and time information, camera model, etc.) you want to use in renaming. This will load the images as tiny thumbnails and displays a preview of their new names on selection, before you actually apply Renaming on the photos. Selection can be made either by clicking individually on the photos, or by using the “All Select” option. Once you are done with choosing the renaming criteria, you can Execute Renaming and confirm your choice to save changes. This free Windows 8 photo renamer app also supports all common image file formats as input. It replaces the original photos after renaming, or saves the output photos in a folder named as “Renamed” (in the target folder) if the “Save to Folder” option is selected. Find PhotoQuickRenamer in the Photo category of Windows Store, or use the link given below to view it directly in Windows Store. App’s Homepage: Click here to get PhotoQuickRenamer. Pictures Synchronizer is basically a photo synchronizer app that lets you synchronize photos taken by different devices or stored in different folders by their time of capturing. Apart from synchronizing photos, you can also use the app to rename your photos. It offers three different types of synchronization modes and anyone can be used to rename photos easily. After choosing the target folder, you can specify a renaming pattern by clicking on the “Synchronize” button. This can include a fixed string, some EXIF data like date, day, or time of capture, and an enumeration (automatic numbering). Once you are all set, you can see a preview and rename all the photos in one go. This free Windows 8 photo renamer app also offers renaming selected files. For that, you can simply click on the image you want to give a new name on the preview screen and change its name from there. 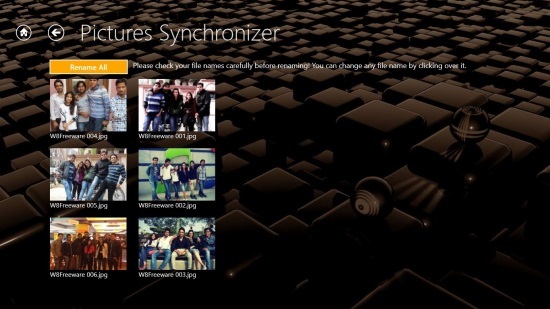 Pictures Synchronizer can be availed freely from Photo category of Windows Store, or using the link given below. App’s Homepage: Click here to get Pictures Synchronizer. Also check out some free Windows 8 Image Editing apps and Collage Making apps.